Built to match the style and performance of the Geometry Series speakers; the Fulcrum 650 offers the Home Cinema Enthusiast the power and accuracy of the new Geometry Drive Technologies. 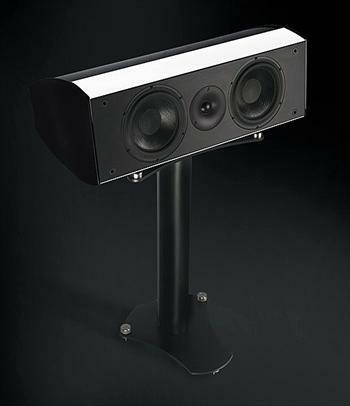 Beautifully crafted and hand built in Britain, the Fulcrum seamlessly blends into the electric sound-stage, presenting clear dialogue and a powerful soundtrack immersing you in the movie experience like never before. Housing two Tactic-II Drive Units, flanked by a single Semisphere Tweeter, the power of the small cabinet is phenomenal. When one considers that typically 80% of the energy being delivered in any Cinema system is the work of the Center channel, then it goes without saying that the strength of any system is only as strong as the performance of its center. The structural engineering in the Fulcrum is taken directly from the Geometry philosophy. The huge volume of air afforded by the A.C.T. Monocoque, Carbon Fibre shell structure ensures that each Tactic-II drive unit will deliver on its promise while achieving the lowest possible level of noise. Sound propagation will remain stealthy and virtually diffraction free. Immersed in real sound, the listener can lose themselves in the Soundtrack of the cinema like never before.